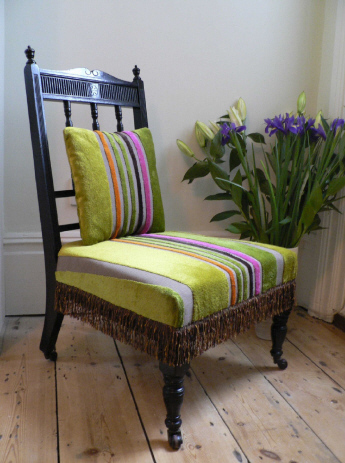 We are an award-winning upholstery and furniture renovation company based in East Dulwich, south east London. We repair, renovate and upholster all styles and ages of chairs and sofas, including antique, mid-century modern and contemporary, in all types of fabrics and leather. We pride ourselves on providing a high quality, flexible and friendly service on all projects regardless of size and budget. We also offer a fabric sourcing and supply service at no extra cost to you. So if you don’t have your own we can help you find the perfect fabric to complement your furniture and suit your budget. We can work with you to design and create bespoke items for your home, including cushions, window seats, headboards and footstools. 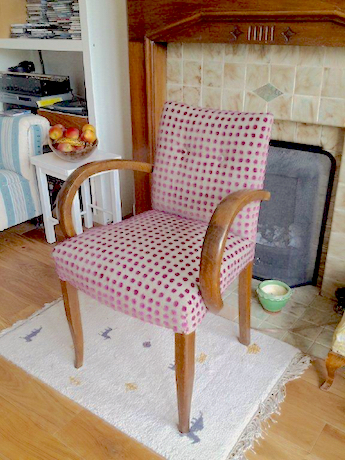 In addition, we often sell beautiful one-off pieces we have lovingly restored and upholstered. We are a small team skilled in all aspects of furniture renovation and upholstery. 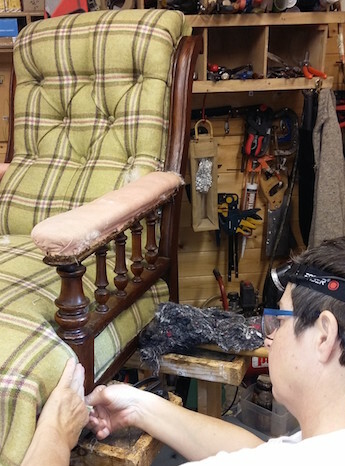 We are led by Karen Wood, an award-winning upholsterer (Worshipful Company of Upholders) who has a City and Guilds qualification in traditional upholstery and furniture restoration from London Metropolitan University. She is also a lecturer at Rose Bruford College of Theatre and Performance on the Scenic Arts BA (Hons) course where she teaches upholstery and prop-making to university students. We run a sustainable practice, ensuring that your furniture remains stunning for many years to come. We always treat your furniture with respect and care to deliver a truly special piece back to you. We are dedicated craftspeople and underneath your lovely top fabric be assured that all our upholstery materials are the highest quality and conform to Furniture and Furnishings (Fire Safety) Regulations 1998/1989, 1993 and 2010. We have a wealth of experience using traditional materials and complex techniques. Most materials are from natural and sustainable sources and include horsehair, wool, jute, cotton, linen, leather and cane. The specialist techniques we employ involve much work by hand, including stitching, springing and caning to completely restore an heirloom to its former glory. Modern upholstery uses contemporary materials such as foam rubber, polyester waddings and manufactured spring units, speeding up the process and making the most of your budget. If you have any concerns or allergies we can talk you through all the options – often a combination of techniques can be adopted, making the most of your budget. We provide upholstery services to domestic clients across south London, commercial clients in London (including The Oval Cricket Ground, café’s and bars) and also West End Theatres (including The Royal Opera House, The National Theatre, The Young Vic Theatre and The Donmar Warehouse).